As the bus approaches Vyatskoye (200 miles northeast of Moscow and 25 miles from Yaroslavl), it is welcomed by a pyramid of barrels. Someone in the back seats explains to a neighbor that Vyatskoye is the "cucumber capital of Russia," the barrels being a symbol of the local cucumber fertility. However, any resemblance to an ordinary village of the Russian heartland ends at cucumbers. The village astonishes with its clear, almost urban planning: There are massive stone houses in the center, built in the urban style, without gaps, with intricate baroque stucco work. It's hard to believe, but almost half of the buildings in Vyatskoye (54 of 114) are officially listed as architectural monuments. There are 10 museums, a three-building hotel, a restaurant, a concert hall and a summer stage here. And this is despite the fact that there are plenty of Russian villages that don’t even have one paved road, not to mention museums and restaurants. But not so long ago Vyatskoye did not look so smart. In the 1990s, the local collective farm, which provided locals with jobs, collapsed, and the village gradually fell into decay, with local residents beginning to disperse to more improved corners of the region. Local resident Nina Maltseva told RBTH that she remembers the Soviet times, when Vyatskoye hosted a rich collective farm and a vocational school, and an active life. But in the 1990s, admitted Maltseva, "it all rolled downhill." Agriculture was not maintained and the school was closed. The changes began in 2006 when businessman Oleg Zharov and his wife Larisa Kovalenko came to the village. In search of a cottage, they bought and restored the "House with Lions" – a two-story building with lion mascarons – which had been left in disrepair after a fire. 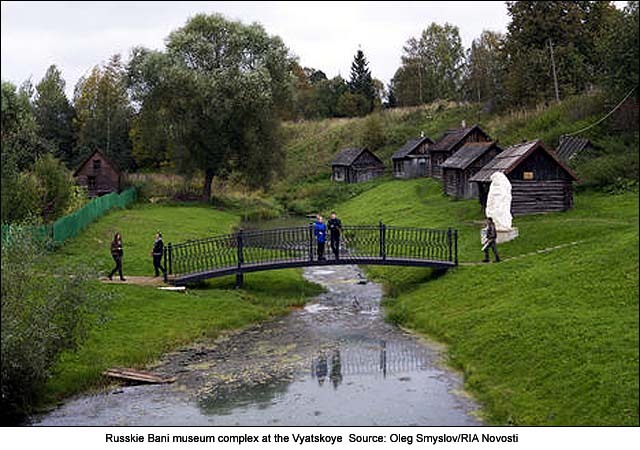 Then they became interested in the history of Vyatskoye, opened the Museum of Russian Enterprise in 2008, and became engaged in the restoration of the historic center. They bought lots and built new houses, decorated with Yaroslavl tiles. In 2012, Zharov received a state prize for the restoration of the village, which he immediately invested in the restoration of the local church. 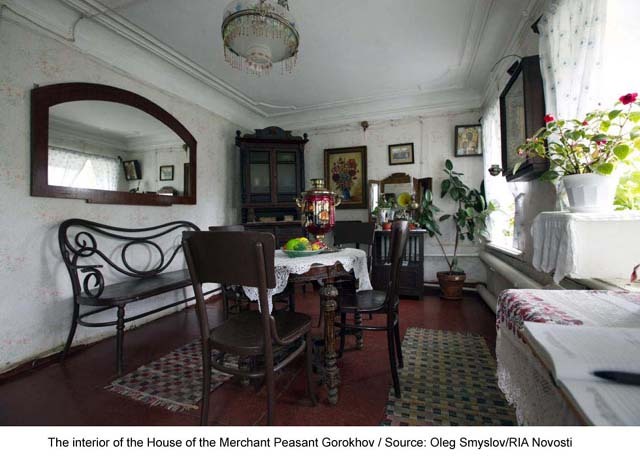 Local resident Svetlana, who works at the House of the Trading Peasant Gorokhov museum, says that Zharov was taken for an eccentric at first. "There were thickets of nettles in the center, we did not believe that the village can be restored," she said. "As a result, everyone is very grateful, of course – now everything is beautified here." Vyatskoye's historical and cultural center has replaced the collective farm as the village's "main enterprise." Now, the village, which has a population of about 1,000 people, draws 100,000 tourists a year. Between 3,000 and 5,000 people come here for the feast of Epiphany alone. Traditionally, believers in Russia take a dip in ice holes and bathing facilities across the country on this day. 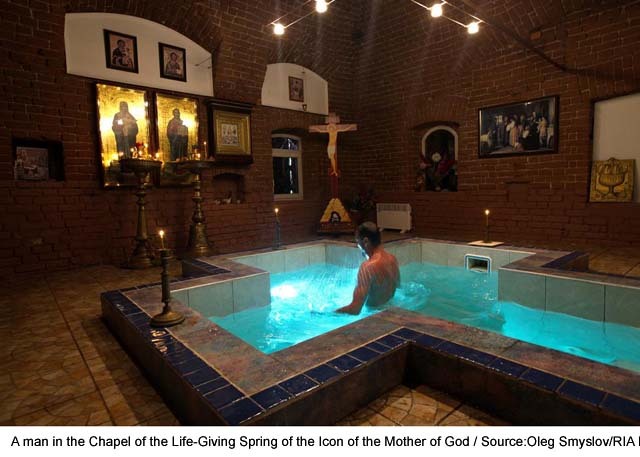 Last year, the village even had to call police patrols to regulate the huge flow of visitors who wanted to plunge into a spring of healing water, which Vyatskoye is also famous for. The bathing facility is equipped in an old red-brick forge building – it has cozy vaults, a tiled stove and icons. Larisa Kovalenko says that a special local mentality has been largely formed due to the history of the village – for example, there has never been serfdom here, and the majority of farmers were engaged in trading and crafts. "About 30 percent of all the stucco work in St. Petersburg is made by hands of Vyatskoye masters," the local museum proudly reports. Meanwhile, the entire northwest of the empire was supplied with famous Vyatskoye cucumbers. The cucumber-growing traditons were preserved in the Soviet time, when families could buy a car with the money. 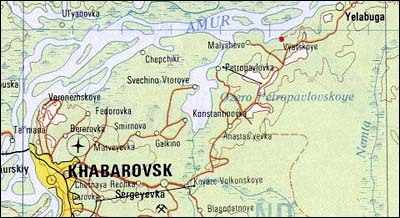 One of the most difficult periods in the history of the village was during the establishment of Soviet power. It was customary then to dispossess the kulaks (wealthy farmers), and churches were blown up across the country. 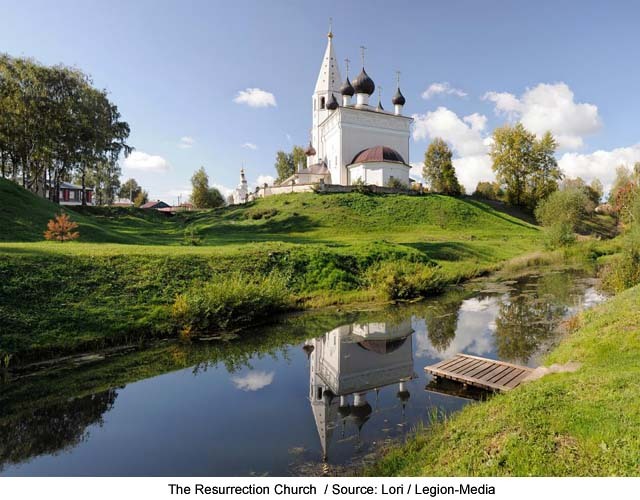 Vyatskoye residents managed to save the 18th-century Resurrection Church and the Old Believers' Icon of the Virgin Church. he Resurrection Church has been now refurbished. The bell tower was even equipped with the latest electronic equipment. A bell ringer is no longer needed – the bells can be controlled using a smartphone app. It is still worth climbing up, especially when it begins to get dark and the lights illuminating the historic buildings are turned on. 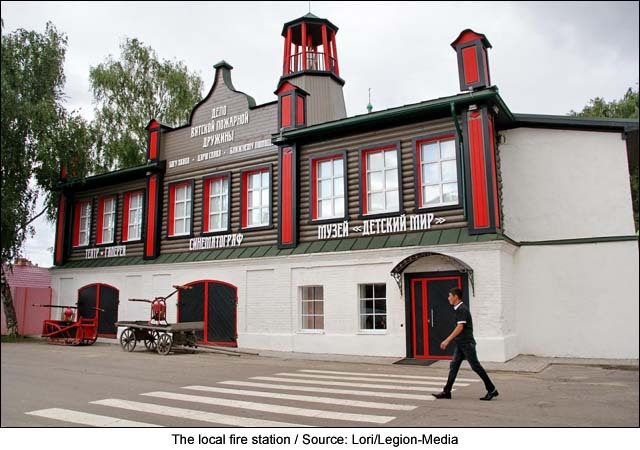 The old buildings of the fire station, local hotel and restaurant have their stucco sides lit by illumination. Vyatskoye at dusk becomes more than just an elegant and beautiful village: It seems that this is the panoramic view of the best that Russia has.